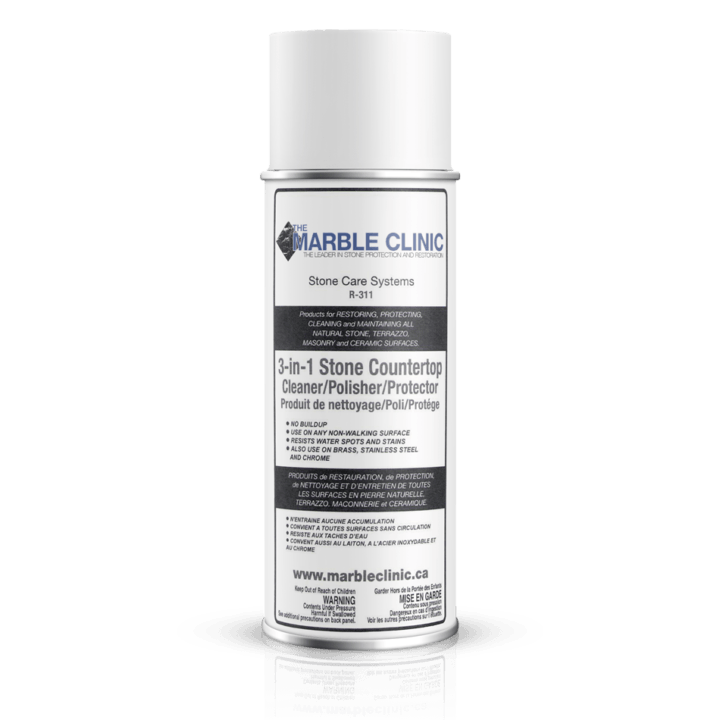 The 3-in-1 stone countertop spray cleans, polishes and protects all high lustre, non-walking stone surfaces. This 3-in-1 Stone Countertop spray is the best way to maintain your Kitchen and Bathroom countertops. Spray on and buff off with paper towel to keep polished marble counters clean, polished and protected. Leaves no buildup, great for any non walking surface! Can also be used on brass, stainless steel and chrome. This is an essential piece of The Marble Clinic’s Stone Care System. Perfect for everyday use, R311 is formulated to keep natural and engineered stone surfaces, such as granite, marble, quartz, limestone, travertine, Corian®, Silestone®, ceramic and porcelain sparkling clean and looking brand new. R311 conditions natural stone surfaces to restore, maintain and enhance their reflective luster and beautiful rich colours. Regular use of R311 makes surfaces easier to clean and leaves a water-resistant protective coating to safeguard against spills, hard water dark spots and etching. Simply spray directly onto the surface and buff with a clean cloth to a lustrous shine.